The light bulb in a Viking oven has a glass dome that covers it. If the cover is not removed properly, it could break. The bulb has two prongs that plug into the receptacle in the oven. 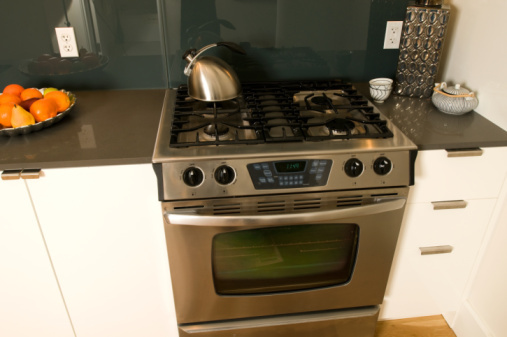 Contact an appliance service company to purchase the correct bulb for your oven. It does not require any tools to remove the glass cover and replace the bulb. Unplug the electrical cord of the oven from the outlet in the wall. This is a safety precaution that should be taken whenever any work is being done on an electrical appliance. Open the oven door and locate the glass dome under which the bulb is connected. Remove the oven racks to make it easier to access the bulb. Push the glass dome to one side while pulling down, and remove the dome. Unplug the bulb from the receptacle. The bulb has two prongs that plug into the receptacle in the oven. Install the new bulb by plugging it into the receptacle. Replace the glass dome by inserting one side, then twist the other side in an upward motion. Plug the electrical cord into the outlet.